Experience a once-in-a-lifetime New Year’s Eve event brought to you by Matthew Gavin Enterprises at the fabulous Marriott Marquis New Year's Eve where Robin Thicke will ignite the Broadway Lounge with a live concert. This high-voltage NYE gala overlooks the world-famous Times Square celebration and ball drop while NY Giants Player, Dancing With The Stars champion, and best-selling author Rashad Jennings MC's a once-in-a-lifetime concert that features Aliana Lohan and Niykee Heaton along with Thicke. Part of the global Times Square NYE tradition, this VIP party takes place on the 8th and 9th floors of the beautiful Marriott Marquis Times Square where guests have front-row views over the entire Times Square NYE extravaganza: the live show and performances, the flashing neon lights, the pulsating crowd of millions of celebrants below, and as a centrepiece of the show, the iconic Times Square Ball Drop. The New Year’s Eve VIP party takes you to NYC’s Times Square, the biggest NYE celebration in the world. Drink, dine, dance and party the night away amid the exhilarating energy of Times Square on NYE. Drink. Your evening begins with a 5-hour premium open bar. Dine: A gourmet dinner buffet and tantalizing dessert buffet will keep you satisfied. Dance: Top DJs will be spinning open format top 40, Hip-Hop and more. Live entertainment to be announced soon. Your party experience will be unsurpassed by any other NYE event, Choose from multiple ticket options offering amazing views of prime Times Square below from its floor to ceiling windows and from its exclusive patio. At midnight, Ball Drop View VIP guests will experience a live view of the world-famous Times Square NYE Ball Drop as the party counts down with the millions gathered below. The confetti shower, the roar, and the thrilling energy of the Times Square crowd: it’s going to be an unforgettable NYE night. Be at the heart of the most iconic NYE celebration in Times Square with all the warmth and luxury of an exclusive NYC private event and special access to Robin Thicke's surprise concert. Taking place on the 8th and 9th floor of the renowned Marriott Marquis Times Square, this VIP party will shower guests with luxurious amenities. The exclusive, invite-only affair boasts NYC’s famed nightlife standards and offers VIP ticket packages with reserved seating, VIP Patio Access, and Ball Drop views. Situated in the heart of Times Square, a stone’s throw away from the Ball Drop, Marriot Marquis Times Square features sophisticated décor – complete with beautiful orb chandeliers – and a wall of windows overlooking glittering Times Square. Join the New Year’s Eve Annual Marquis VIP Party and usher in the New Year with the thrill of the Times Square NYE celebration and spectacular views of the iconic Ball Drop. 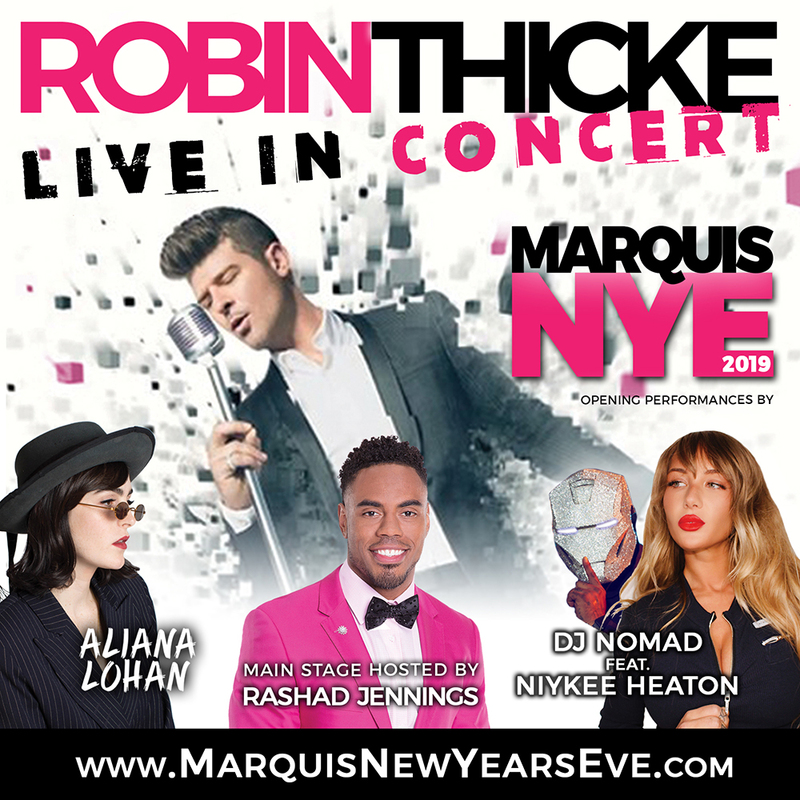 Watch Aliana Lohan, Niykee Heaton, and Robin Thicke perform live for a New Year's Eve annual celebration to remember.